DALLAS, TX – March 5, 2018 – Mohr Partners, Inc., the world’s largest wholly-owned commercial real estate services firm providing global corporations and US public-sector clients with integrated full-service solutions exclusively to occupiers/tenants, was named by The Lipsey Company as one of the Top 25 Brands in their industry segment. 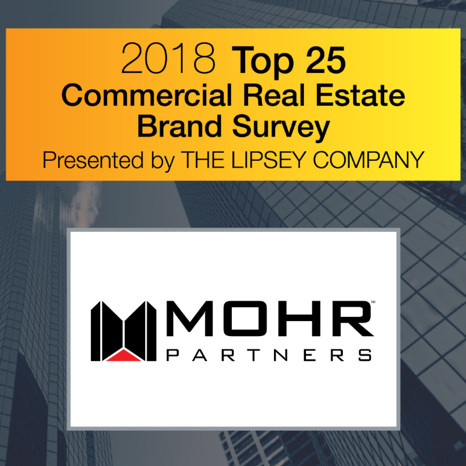 This is the first time in Mohr Partners’ 31-year history the firm has been included in The Lipsey Companies Top 25 Survey, which includes other well-known commercial real estate brands including CBRE, JLL, and Cushman & Wakefield. The Lipsey Company survey included over 10,000 U.S. and international commercial real estate professionals many of which have participated in this survey since its inception in 2001.